Pairing an iPhone with Apple Watch is an extremely easy task. But there are still unexpected factors that could ruin the paring process and cause it to fail. Basically, the problem is caused by software glitches on the iPhone such as rogue apps, invalid settings, and data corruption. Bad updates might sometimes be the main reason. If you are encountering the same problem when your new iPhone XS Max cannot connect to your Apple Watch, here are a few potential solutions that you can try. Read on this post whenever you need help. Before proceeding, you should make sure that Airplane Mode is not enabled on both your Watch and your iPhone XS Max. Wi-Fi and Bluetooth also need to be enabled. Simply swipe up from the top right corner to open the Control Center and then check on these features. Your Apple Watch should be fully charged since low power might also result to connection errors. Distance is also another thing to consider, so you need to keep your Apple Watch and your paired iPhone close to each other. Additionally, you should check your device compatibility. Make sure that your Watch is compatible with your new iPhone XS Max and iOS 12 platform. If your iPhone XS Max still cannot connect to your Apple Watch even when you meet all requirements, you should then try the following solutions to clear out software-related errors. Press and hold the Power button for a few seconds. When you see the Slide to Power Off command, release the button and then drag the slider to the right. Press and hold the Power button until the Power Off slider appears on the screen. Drag the slider to power off your watch. After 30 seconds, press and hold the Side button until you see the Apple logo. Your Apple Watch will now boot up and make sure it’s fully charged. If your Apple Watch is charging, you need to take the charger off first since the Watch will not restart if it’s charging. Solution 2: Toggle Bluetooth OFF and enable it again. Head over to your iPhone Settings-> Bluetooth. Tap on Bluetooth switch to disable it. Once Bluetooth is disabled, restart your iPhone XS Max. Next, re-enable Bluetooth from the Settings-> Bluetooth. Wait until Bluetooth is turned on, then try pairing or connecting to your Apple Watch again and check if it works. If the pairing is still unsuccessful, switch to the next applicable solutions. Navigate toSettings-> Airplane Mode menu. Toggle the Airplane Mode switch to ON. This will then disable all wireless radios on your iPhone XS Max. Once Airplane mode is already turned ON, restart your iPhone. After your phone boots up, go back to Settings-> Airplane Mode. Toggle the Airplane Mode switch OFF After that, all wireless functions will be then re-enabled. Wait until the Bluetooth on your iPhone is enabled and you should then attempt to pair your iPhone XS Max with your Watch. Solution 4: Unpair your devices and then pair them again. If the connection is suddenly unable, the pairing might get corrupted, and it’s no longer working. In this case, you need to remove the previous pairing and start a new one, which is free from flaws. First, attempt to unpair your iPhone XS Max and your Watch or other connected Bluetooth watches and then pair them again. Choose your watch at the top of the screen. Tap on “i” icon next to your Watch to unpair it. Tap on Unpair Apple Watch option, and then confirm it. After you unpair it, perform these steps to reset your Apple Watch. Switch on your Apple Watch if it’s off. After your Apple Watch is turned on, put it close to your iPhone. Until the pairing is done, hold your iPhone over the animation and then wait for a message prompting that your Apple Watch is successfully paired. Follow the onscreen instructions to set up your Watch as new or restore data from a backup. When you are prompted with signing into your Apple ID, enter your Apple ID password. Set up your watch and then wait for it to start syncing with your iPhone XS Max. Once again, you need to connect your iPhone to Wi-Fi or a cellular network and also enable Bluetooth. Choose Reset Network Settings option. Doing so will erase all your current network settings such as Wi-Fi networks and Bluetooth connections. Enter your passcode when prompted to continue. Tap on the popup again to confirm a network settings reset. 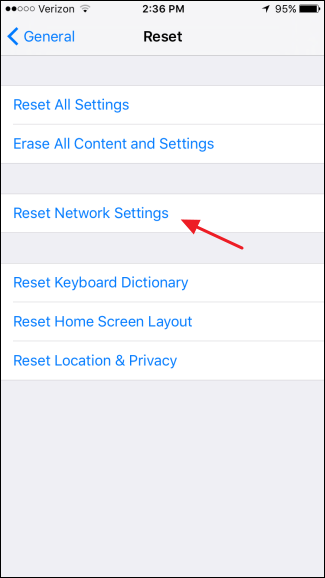 Once the reset is done, default network options and settings will be loaded up on your phone. You will then need to re-enable Wi-Fi, Cellular network as well as Bluetooth on your iPhone.